Evangeline, A Tale of Acadie (1847) is an epic poem by American poet Henry Wadsworth Longfellow, describing the tragic account of two lovers, Evangeline and Gabriel, separated on their wedding day during the expulsion of the Acadians from Nova Scotia. Reunited in old age, Evangeline, now a nun, tended to Gabriel in the last few minutes of his life, when she happened upon him by chance as she cared for the sick in Pennsylvania. 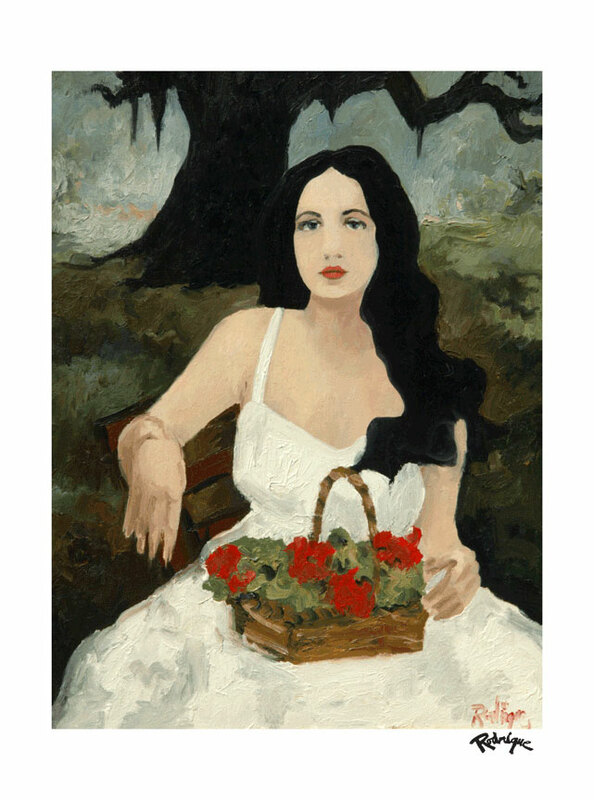 This heartbreaking and romantic story inspired many artists, including George Rodrigue, who painted her more than one hundred times in his career, oftentimes painting her as she waited for Gabriel beneath the Evangeline Oak in southwest Louisiana. He used several models for Evangeline, including a waitress he barely knew, a silent movie actress (Dolores del Rio) he never knew, and most often the daughter of his good friends Bertha and Curtis Bernard. He photographed Diane Bernard Keogh during several sessions in the 1970s and used these same photographs for Evangeline paintings over the next twenty years, including this one. This special print is released in conjunction with a new exhibition, Rodrigue’s WOMEN, open now until September 8, 2017, in New Orleans, and featuring thirty original paintings by George Rodrigue ranging in date from 1963-2013. 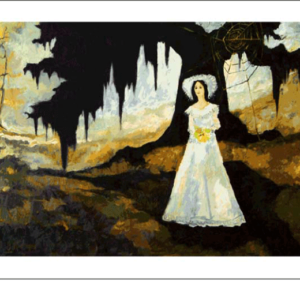 All prints sold directly by the Rodrigue Estate are also accompanied with a certificate of authenticity indicating the number of the print purchased from the estate. 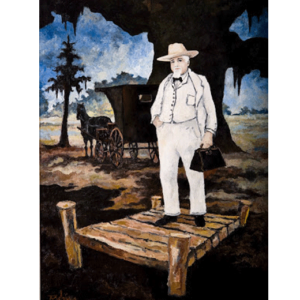 Get the latest Rodrigue Studio updates.